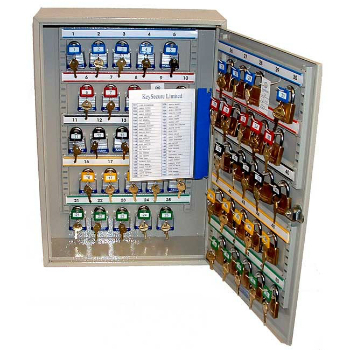 This range of Key Cabinets from KeySecure are ideal to house keys in a number of commercial locations such as corporate buildings, offices, showrooms, warehouses and hotels. Providing theft protection the KeySecure range is available in a number of sizes to accommodate 50 to 200 keys. These high quality cabinets can be securely wall mounted through pre drilled holes and are fitted with height adjustable hook bars as standard to hold a variety of key sizes. Furthermore KeySecure provide colour coded hooks with key tags, rings and numbers to ensure optimal organisation, security and accountability. For more information regarding Key Cabinets call one of our Security Specialists on 0117 967 4994 for additional help and advice when purchasing the right security product for you.